Introduction: Announced on the 5th of March 2007, alongside it's "little brother" the Olympus E-410, the Olympus EVOLT E-510 is currently Olympus' top of the range Digital SLR, it features a 10 megapixel sensor, a 2.5" screen, a 3x optical zoom Zuiko Digital kit lens, all the usual features so far... except the E-510 features a 10 megapixel LiveMOS sensor, this allows a live view to be viewed on the screen. It also features built in sensor based image stabilisation, Olympus Super Sonic Wave Filter (dust reduction), dual slot memory compartment, and a whole heap of shooting modes. The Olympus EVOLT E-510 is available from around £596 with a 3x optical zoom kit lens, or £698 with twin kit lenses, this makes it very good value for money, as one of the cheapest Digital SLRs with both image stabilisation and live view. The camera is enclosed in a sturdy body and is available in black. The body measures approx. 136 x 91.5 x 56 mm (without protruding parts), and weighs approx. 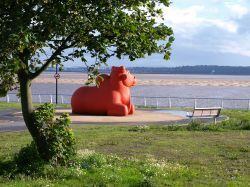 460g. excluding battery and memory card. "The latest example of Olympus commitment to imaging excellence and precision. 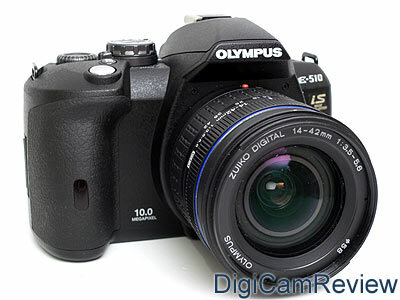 The 10 megapixel Olympus E-510 digital SLR is ready to deliver nothing short of the ultimate in professional-grade photography. Live View, a built-in image stabiliser for razor-sharp shots in shaky conditions and a new engine to guarantee exceptional noise performance create a legend. This model features a high resolution 6.4cm/2.5" HyperCrystal LCD, hi-speed USB 2.0, a dual-slot memory compartment for xd-Picture Card and Compact Flash, and a range of 18 convenient scene modes." You can find more information on their website (Olympus EVOLT website here). 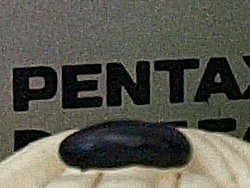 Front view - lens off, lens release button. Front view - infra-red receiver, Olympus Zuiko Digital 14-42mm lens. Back: Play, Delete, Menu, Info, Optical viewfinder with diopter corrector, AEL / AFL, IS, Live view, 4 way controller, OK, Fn (customisable), AF area, USB / Video out, 2.5" screen. Top: Flash, Shooting, Flash hot-shoe, Mode dial, SSWF blue led, On/Off, Shutter release, Exposure compensation, control dial. Side memory compartment - XD and Compact Flash slots. Bottom - lockable battery compartment, metal tripod mount, chunky BLM-1 7.2v 1500mAh Lithium Ion battery - this charges outside the camera with the provided charger. Slightly better than average box contents - you don't get a memory card as is the norm for all Digital SLRs, however you do get a high quality Olympus neck strap, and an impressive user guide on DVD that covers the basics of using the E-510, as well as general lessons in photography., white balance etc. 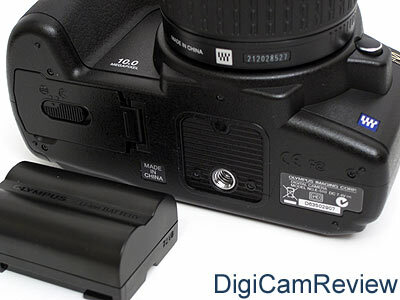 Battery usage: Battery life is rated at 650 shots according to CIPA standards using the optical viewfinder. Expect battery life to be much less if you are mainly using the Live view. I was able to take over 450 shots before "battery empty" appeared - I used Live View for a number of shots. 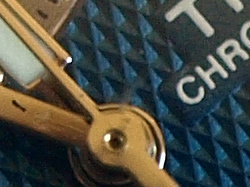 Camera Operation and Options: The camera mode is selected using the top dial. This allows the choice of: Auto, P, A (aperture-priority), S (shutter priority), M (Manual), Portrait, Landscape, Macro/Flower, Sport, Night Portrait, and a further 18 Scene modes . 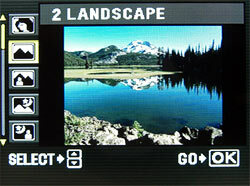 Screen / LCD display in photo mode: (shown above, right) The screen resolution with 230,000 pixels is very good, and can display a histogram after each shot. The screen is clear and the text and menus are easy to read. In the display is - shutter speed, f setting, mode (manual/auto/shutter priority/aperture priority), date, number of shots remaining. You can also press OK, and use the 4-way controller and change the options on the screen such as: ISO, White Balance, Colour mode, Flash - auto, red-eye, flash on, no flash, red-eye slow, flash slow, flash slow 2, full, 1/4, 1/16, 1/64 (there's also a pop up flash button on top of the camera), Metering, Focus area, Focus mode - single, continuous, manual, single with manual, continuous with manual, Shooting mode, CF/XD, Picture quality - SHQ, HQ (adjustable compression), SQ (adjustable size and compression). Further options become available by pressing the INFO button as shown above right, for example: Sharpness, Contrast, WB R, G, Saturation, Gradation, Colour Space, Flash strength. Photo menu 1: Card setup, Custom Reset Setting, Picture mode (Vivid, Natural, Muted, Monotone, Sepia - each option allows you to change Contrast, Sharpness, and Saturation), Gradation (High key, Normal, Low key), Picture Quality (RAW+SHQ, RAW+HQ, RAW+SQ, RAW, SHQ, HQ, SQ), White Balance (Each of the following options allow the R and G to be adjusted further, and allow a white balance preview shot: Auto, Sun 5300k, Cloud 6000k, Shade 7500k, Bulb 3000k, Fluorescent 1 4000k, Fluorescent 2 4500k, Fluorescent 3 6600k, Manual White Balance, Custom White Balance (2000 - 14000k)), ISO (Auto, 100 - 1600), Noise Filter (Off, Low, Standard, High), Noise reduction. Photo menu 2: Metering (ESP, ESP+AF, Centre-weighted, Spot, Spot-hi, Spot-sh), Flash strength (+2, -2), AF mode (S-AF, C-AF, Manual, S-AF + MF, C-AF + MF), Focus area (Auto, Left, Centre, Right), AE / WB / Flash Bracket (3F 0.3EV, 0.7EV, 1.0EV), Anti-shock (Mirror lock up Off - 30 seconds). Setup Menu 1: ISO Limit, EV step (1/3, 1/2, 1), All WB set, HQ compression ratio, SQ image size / compression setting, Flash +/- + Exposure +/-, X-Sync, Auto Pop-up, Dial (Ps, Exposure / Manual Shutter, Aperture), AEL / AFL, AEL / AFL Memo, AEL Metering, Quick Erase (On, Off), RAW+JPEG Erase (JPEG, RAW, RAW+JPEG), Function button (Off, One Touch WB, Test Picture, My Mode, Depth of Field Preview, Live DoF Preview), My mode setup, Focus ring (direction), Flash AF illuminator (on, off), Reset lens, Live view boost, Release priority S, Release priority C, Beep, Frame assist (Off, Golden Section, Scale), 4-way controller Lock (on, off). Setup Menu 2: Date / Time, CF/XD, File name, Edit filename, Screen brightness, Language, Video out, Rec view, Sleep, Backlit LCD, 4 h Timer, Button Timer, Priority Set, USB Mode, Colour space, AEL/AFL / Fn button swap, Shading compensation, Pixel Mapping, Cleaning Mode, Firmware (Body 1.0, Lens 1.0). Optical Viewfinder (pictured above, left): has a diopter corrector. There is no electronic viewfinder. The optical viewfinder shows additional information to the right, such as aperture, shutter, focus, flash, mode, white balance, image stabilisation, battery life etc. Scenes: As shown above, this shows an example photo, and then shows a second screen explaining the scene mode. The scene modes available are: Portrait, Landscape, Landscape and portrait, Night scene, Night Portrait, Children, Sport, High key (enhances bright areas), Low key (enhances dark areas), DIS Mode (Digital Image Stabilisation boosts ISO), Macro, Nature Macro, Candle, Sunset, Fireworks, Documents, Panorama (Uses the Live View mode, Olympus "Panorama" XD Card required! ), Beach and Snow. Live View Mode: Olympus (and Panasonic) are unique in being the only companies to currently offer Digital SLRs with live view - this basically means that you can view the view through the lens / sensor on the screen, whereas with a normal Digital SLR you have to hold the camera up to your eye (you can still do this with the E-510 when you want). This means that you can hold the camera away from you and potentially get more creative shots, or get shots in awkward angles and positions. 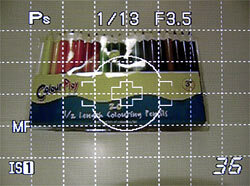 Other benefits are the ability to view a magnified view of the subject to aid focusing (specifically manual focusing). Live view boost will boost the brightness of the screen image in low light, and in extremely low light the picture will brighten up but in black and white. The refresh rate isn't very quick with this feature turned on, turning it off speeds up the screen noticeably. Despite the camera having a fixed screen (ie it doesn't swivel or rotate), the viewing angle is impressive, you can hold the camera high above you, or at an extreme angle and you can still see the screen clearly without the colours going wonky. The live view mode looks like a normal digital camera, showing the mode, shutter, aperture, settings, remaining photos etc, as well as a live (RGB) histogram. You can access the on-screen menus in the same was as you would in the normal mode. 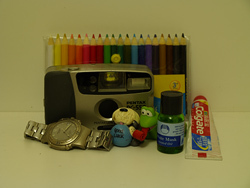 For example the focus mode, and white balance options. The white balance will show you on screen the effect instantly as you choose a new white balance mode. There are a number of frame assist overlay displays such as the grid view above, a golden rule grid, and a scale view. The live view will also let you select an area to zoom into and then show you a real time magnified view at 7x or 10x zoom, allowing you to check focus, or to check manual focus. 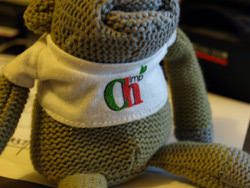 You can also view a live Depth of Field preview by setting the Function button. Playback (Review) mode options: Scrolling through the photos is quick! The zoom is quick and works at up to 14x. There are numerous views available, zooming out will get you a 4, 9, 16, 25 thumb view, zooming out further gives you a calendar view. Pressing the INFO button you get a normal view, with basic information, more detailed information with RGB histograms, a full size histogram, highlight view, shadow view. Whichever view you choose, it will show this view as the review mode view when you next take a photo. Pressing the FN (Function) button you can set an area to zoom into, and then scroll through the photos with that area magnified. Pressing the AF Area button allows you to compare photos side by side, and zoom into both photos at the same time. The exposure compensation button will rotate the image. Playback menu: Slideshow, Auto Rotate (on, off), Edit (Black and White, Sepia, Red-eye fix, Saturation, Resize), Print menu, Copy all (CF to XD and vice versa), Reset Protect. As shown in the table above, higher quality images take a large amount of memory, so a high capacity memory card is definitely recommended, unless you're prepared to sacrifice image size or use higher compression options to fit more pictures in memory. 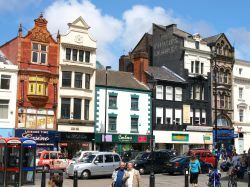 There is a very good choice of image sizes and compression options (although unfortunately no choice regarding aspect ratio), and inclusion of RAW image mode means you can ensure no image quality is lost before any further editing occurs. Find the latest prices for CF (Compact Flash) memory cards at Amazon.co.uk: 512mb: £3, 1gb (1024mb): £11, 2gb (2048mb): £18, 4gb (4096mb): £37, 8gb (8192mb): £91. Need more help deciding what size memory card to buy? 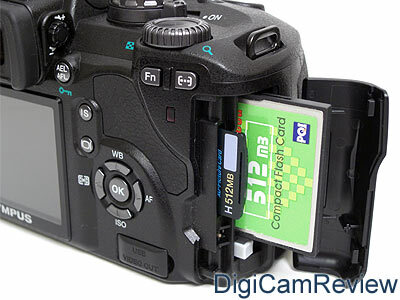 Click here to read my article called "What Size Memory Card Should I Buy?" Speed: The camera is very quick to switch on and take photos, from off, to taking a photo in 1.6 seconds. Focusing seemed fairly quick, except in very low light when the flash-assist is used - this can seem to take a long time to focus depending on the subject. The playback mode is also fairly quick. The camera shutter response seemed instant when pre-focused responding in 0.1 seconds or less - and shot to shot time was quick, with a delay of around 0.5 seconds between shots without flash. The flash recharge time was very good and can be used in continuous shooting mode taking a photo every 0.5 seconds (roughly 2fps). The cameras menus seemed quick. Continuous shooting is very quick, at roughly 3fps for multiple shots at the highest resolution, dependant on card technology used - with compact flash 6 shots could be taken sequentially at maximum resolution (RAW/SHQ) before there is a delay while the files were written to the memory card. Using SHQ JPEG, unlimited shots can be taken at 3fps assuming you are using a fast card. The Live View mode slows down the photo taking process, as the camera has to switch back to the normal mode, take the photo, then switch back to the live view mode. Ease of use: The camera is very easy to use, especially in the AUTO mode and the scene modes, even though the camera has a lot of options. The controls on the back of the camera are quite straightforward - the menus are responsive and easy to read and navigate. The menus are also easy to use, and the options are big enough and easy enough to see clearly. The modes are easy to access, quick and simple, mainly thanks to the large screen (most options are easily accessible by use of the ok button and the direction arrows) which makes it easier to use. It is useful to read the advanced manual to help familiarise yourself with some of the more technical features of the camera eg; knowing that S-AF and C-AF mean single focus and constant focus was useful. As with nearly all Digital SLRs: to get the most out of the camera you may want to use RAW, this adds an additional step to the image taking process, meaning that you have to convert the images to JPEG before you can email them to friends or use them in other programs; You may also need to learn how to use custom white balance, and the preset white balance modes to get the best colour from the camera. So whilst the Olympus E-510 is very easy to use in AUTO mode, (simply point and shoot), to get the most out of the camera may take some time. The included DVD Guide is a great resource and will definitely help you start using the camera and develop your skills further. 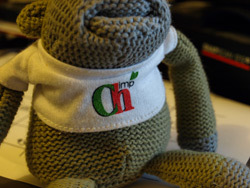 Olympus could improve by including built in help like in some of their other cameras, so that you don't have to refer to the manual to find out what the acronyms mean. Ergonomics and Buttons: (Feel, placement, labels, etc) The buttons are easy to use, and they are in a good position. There seem to be a lot of buttons but this allows easy access to the essential functions and features while you're composing your shot. The buttons feel okay, although some may find them small. The shutter release is good. The scrolling wheel has multiple functions and in play mode is used to zoom in on your picture so you compare magnified sections of one image with the previous or next, making it simple to decide which shot is the one with least camera shake. I thought the camera felt very good ergonomically, and a large rubber hand grip, and a decent size rubber grips at the back for your thumb. The camera feels like a solid, robust and well built camera. A mechanical focusing ring would have been nice. The shooting mode button could have been located in a better position, as I often forgot it was on the top of the camera next to the flash release button. 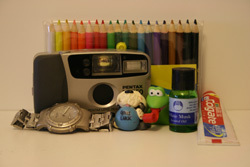 Image Quality: Here are some real world sample photos taken in various settings, such as Inside, Outside, Macro, to demonstrate the quality of pictures taken and also show different features of the camera. Larger versions of these photos, plus more photos are available in the Olympus EVOLT E-510 Sample Photo Gallery! Inside: The camera has very good colour - It took a good "Heather and Flower" photo - there is no red-eye in the photo - this photo was shot with the Noise Filter set to Low, resulting in slightly overly sharp detail in the face, more flattering results can be had from leaving the Noise Filter on standard for portrait photos, this setting was used for the group photo. It has a very good flash, and copes well with group photos, and on AUTO ISO, the ISO setting was kept quite low in these photos. The camera did a good job at focusing even in low-light. 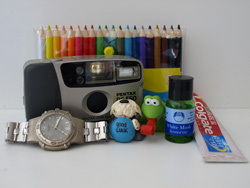 There is an AF-Illuminator that flashes the camera's main flash at people to help focus, however this can be switched off and focusing is still good. Colour is richly saturated and can be altered, Program mode defaults to VIVID colour, whereas AUTO defaults to Natural colour. Flash photos were occasionally slightly under-exposed. Below you'll find the noise test image, plus actual pixel crops, viewable at 100%, from the image taken at different ISO settings, compared with the 10 megapixel Olympus EVOLT E-400 and 10 megapixel Canon EOS 400D. ISO Noise Test Photos - Flash is off. Olympus E-400 on the left, Olympus E-510 in the middle, Canon EOS 400D on the right. Any tonal difference is due to white balance or lighting / metering differences. Nb. Please roll your mouse over the Olympus E-510 images, the first image is with the Noise Filter set to Standard, the second image is with the Noise Filter set to Low. I have included both sets, as I found the default Noise Filter setting of Standard caused images to appear overly soft, and found that with the Noise Filter set to Low, detail is much better. Nb. Rolling your mouse over the images above will show you the same E-510 examples with the Noise Filter set to Low. Noise results - Noise Filter on Standard: If you leave the Olympus EVOLT E-510 Noise Filter setting on the standard setting you will be pleased by the camera's low noise (with is pretty much noise free upto ISO800), as it matches the Canon EOS 400D for smooth noise free images, and has much less noise than the 10 megapixel Olympus E-400. However, you wont necessarily be pleased by the lack of detail and general softness the images suffer from. You may think that the solution is to increase the sharpness in camera, however, the sharpness setting doesn't have much effect when the Noise Filter is left on standard. Noise Results - Noise Filter on Low (Rollover): If you do find the images too soft, then setting the Noise filter to Low produces much more detailed images, but with more noise. 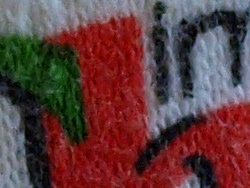 Looking at the images taken with the Noise Filter on Low, noise appears worse than the Canon, and slightly worse than the E-400. I would say that noise is acceptable upto ISO400 / ISO800, with ISO1600 best avoided. Reducing the sharpness setting can make the noise less noticeable, whilst still retaining good detail. Noise Filter and Sharpness Settings (Skip this section if you want, as you can quite happily ignore it, but if you're interested then feel free to read) - The Olympus E-510 gives you a number of controls that effect noise and detail in images, with numerous noise filter settings (Off, Low, Standard, High) and several sharpness settings (-2, -1, 0, +1, +2). The noise filter setting determines how much noise is removed from the photo, with the result being that the more noise you remove, the more detail you also lose. Similarly the sharpness setting can also play a part in noise levels, the more you sharpen the image, the more noticeable noise will be. To help you see what difference these settings has on final image quality, I have shown examples below. All shots taken at ISO800. From this it looks like the best results are had with the Noise Filter set to Low, as images are overly soft when it is on Standard and the High setting is even softer still. Then the Noise Filter is Off images have high levels of noise at almost every ISO settings (even ISO100). With the Noise Filter Off you should be able to get the most detail possible from the image, however noise becomes much more noticeable. From these examples you can see that the sharpness setting can increase noise levels, and when sharpness is set to -2 the noise is less noticeable than when the setting is increased. 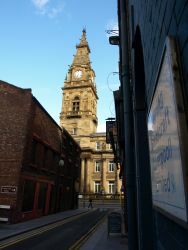 The sharpness setting doesn't have much effect when the Noise Filter is on the standard or high settings, perhaps because the images are too soft for the sharpness setting to have any effect. 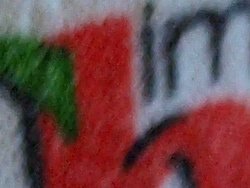 Increasing the sharpness too much can cause image artefacts such as the "halo" effect / white outline around the edges of text or objects. It is important to find a balance in the middle where you have good detail, acceptable noise levels, and acceptable sharpness without image artefacts. I found the best image quality was achievable with the Noise Filter set to Low, and sharpness at 0 or -1. When the Noise Filter is Off or set to Low, setting sharpness to -2 makes the noise less noticeable. Outdoors photos shot with a low ISO setting benefit from the Noise Filter being set to Low so that more detail is kept in the photo, as I wasn't very impressed by the high levels of softness in images when the noise filter was on standard. 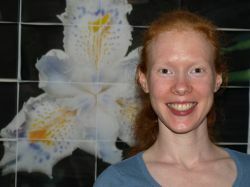 However, you may find that portrait photos indoors with flash tend to look more flattering to the subject when the noise filter is on standard. I would recommend you try experimenting with the settings yourself until you find the most satisfying settings to suit your style of photography. Image Stabilisation: The Olympus EVOLT E-510 is the first Olympus DSLR to feature built in image stabilisation - this is a sensor based image stabilisation system that will move the image sensor to counter any camera shake. This feature helps reduce image blur due to low light or long zoom photography. There are three options: OFF - Image stabilizer is off, I.S. Mode 1 - Image stabilizer is on, I.S. 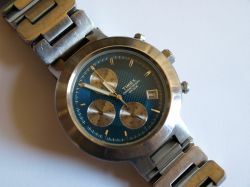 mode 2 - "This is used when panning in the horizontal direction to achieve a blurred background. The horizontal image stabilizer is turned off, and only the vertical image stabilizer is activated." (from the Olympus Manual). You can also activate / view image stabilisation in the Live View mode by holding the IS button. Here are some test photos taken with Image Stabilisation on and off - these photos were taken without flash indoors, in low light, with ISO set to 800 and the lens partially zoomed in. Actual pixels crop taken from the centre of the picture. As you can see - image stabilisation is effective for low-light / high zoom, slow shutter speed photography helping achieve blur free photos in situations where you normally wouldn't be able to get a sharp image without the aid of a tripod. Outside: The camera has quite rich, saturated colours when set to Vivid - the Natural setting can seem a little dull in comparison. There was very good detail with the Noise Filter set to low, and the camera took a number of very pleasing images outside, with good contrast, but there was occasionally highlight clipping where white objects would be pure white. Purple fringing was low. 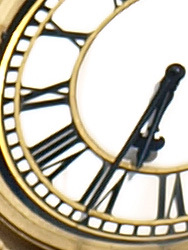 In general 'normal' quality jpeg artefacts are not easily seen, however areas with strong contrasts benefit from use of the highest quality setting. Zoom: This kit lens provides a 3x optical zoom starting at wide-angle (28mm equivalent) which is great for 'normal' everyday photography. There is an option of a double lens kit which provides an additional 40 - 150mm lens, which provides the equivalent of 80 - 300mm zoom. 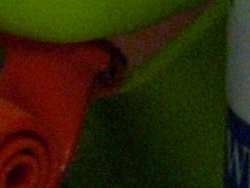 I've included examples below to show what the zoom is capable of. There is no digital zoom on this DSLR or any other DSLR I'm aware of. 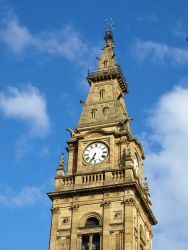 Exposure: The photos of the clock tower are exposed well with detail in the dark areas as well as the lighter areas - exposure in other photos was generally good. 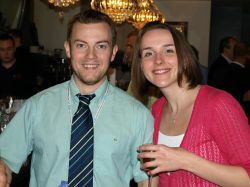 Purple fringing was not noticed in these photos. Vignetting was not noticed. It can be useful to under expose images with bright backgrounds (eg; sky) with use of exposure compensation. Lens noise and zoom: The lens is very quiet, making almost no noise when switched on due to the lens already being in position. The manual zoom ring also means that zooming is silent and it gives you very good control of how you frame your subject. Like all SLR's the shutter noise is distinctive and provides some indication of the shutter speed. On the E-510 it is noticeable, and if you're used to the silence of a compact point and shoot digital camera, then you may notice the shutter sound is considerably louder than your point and shoot camera. Other Image Quality issues: Purple fringing was occasionally seen particularly in areas with high contrast (for example tree branches against a bright sky). 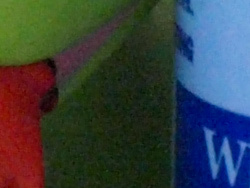 Using the lens set to telephoto zoom, you are able to get a better macro photo - colour and detail is good, and there appears to be fairly low noise at ISO200. The lens / autofocus allows you to get roughly ~10cm away from the subject to the front of the lens using the 14-42mm kit lens. Setting the white balance manually helps achieve better results, and even better results will be possible with a dedicated macro lens. 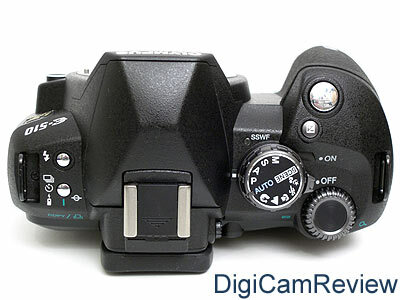 Video mode: This DSLR, along with every other current Digital SLR, does not feature a video mode. 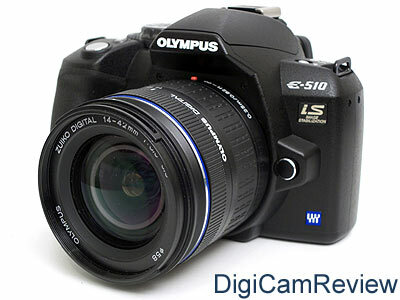 Even though it does have a live view feature, Olympus have not made a video mode in their current Digital SLRs. Value for Money: The Olympus EVOLT E-510 from around £596 with kit lens, or £698 with twin kit lens, is good value for money, considering the number of features this camera has over the other competition, Live View and Image Stabilisation being two of the main features. The camera also comes with very good Zuiko Digital lenses as standard. 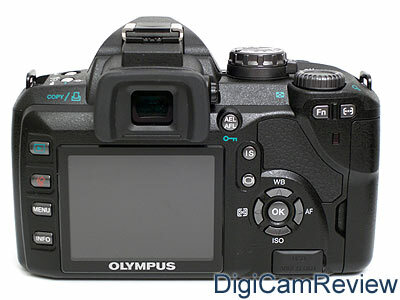 Other digital SLR cameras offering similar features and controls are the 10 megapixel Canon EOS 400D, Olympus EVOLT E-410 (Live view), Olympus EVOLT E-400, Nikon D40x, Nikon D80, Sony Alpha A100 (Anti-shake), and Pentax K10D (Anti-shake). 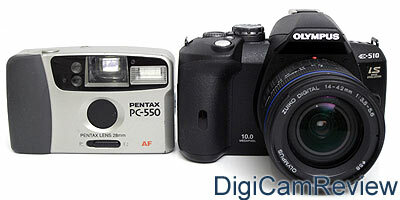 Available for slightly less are the 6 mp Pentax K100D (with image stabilisation), Nikon D40 and Nikon D50. 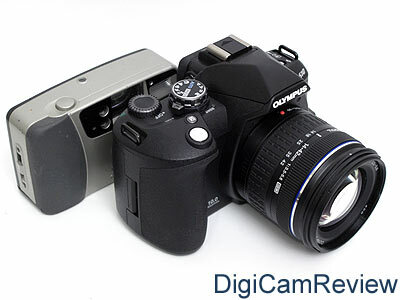 (9/10) See more digital camera reviews sorted by megapixels here. Summary: The Olympus EVOLT E-510 has a number of appealing features, built in image stabilisation, a working dust reduction system, high quality kit lens(es), solid body with good grip, and one-touch white balance. However it goes one step further than the majority of the competition with an impressive Live View feature, this lets you see your subject without having to have the camera pressed to your face, and includes an impressive magnified view to help with manual focus. The camera also delivers the goods, with excellent image quality, once it's tweaked to your liking regarding noise reduction. I'm regularly surprised by people who feel the need to buy one of the "main brand" Digital SLRs in preference to the Olympus EVOLT E-510 with image stabilisation, dust removal, a decent kit lens, and live view. The camera has excellent responsiveness, as you would expect with a DSLR, and has a fast continuous shooting mode and fast flash recharge. The camera comes with features and modes to suit the beginner all to way up to professional photographers, and is currently the cheapest Digital SLR to feature Live View and Image Stabilisation. Photographers will be very happy with this camera. Highly Recommended! Available for £386 or £411 - or Get the best price below! 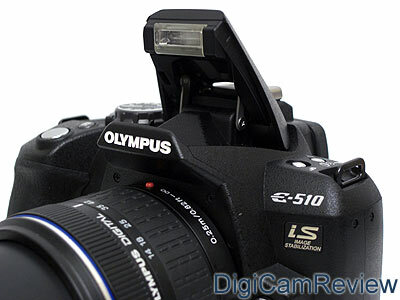 Olympus E-510 DVD User Guide covers use of the camera and general photography! Panorama mode only available with Olympus "Panorama" XD cards! Additional Test Images are viewable in the Olympus EVOLT E-510 Sample Photo Gallery. 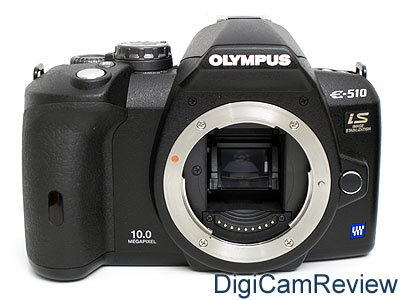 Olympus EVOLT E-510 User Manual Download available from Olympus America. Additional resources: To help protect your home or business, surveillance camera systems can be a critical part of keeping you safe. There are many kinds of surveillance cameras out there to choose from based on how robust you want the system to be. For amazing prices on security video cameras, check on the net.